Pits & Perils (P&P) is an old-school fantasy RPG created by James and Robyn George that is quite unlike most other OSR games. It is designed to be simple, modeled after the earliest D&D incarnations of the 1970s, but with many unique elements and rules. I’ve played in or ran a few P&P games over the past year or so, it is fun and quite a pleasure to be on either end of things. There is a basic setting and a few adventures available, along with two rules supplements that add more classes, spells, monsters, mechanics and magic items. There is a fairly active G+ community. For referees, P&P really hits the sweet spot of minimal prep time and simple mechanics. The supplements are presented such that referees can pick and choose what ext ras they would like to add to their games. The basic game mechanics use six-sided dice only (with optional rules for d20-based combat in one of the supplements), the general rule is 9+ to-hit and 7+ to save or apply an ability or skill, on two dice. As a player, you won’t waste much time creating a character, the whole process takes about five minutes. Choose or roll an ability, choose your class and side (alignment), roll for gold, outfit your PC, record a few stats (hits, armor bonus, spell or faith points) and you’re done. There are the usual six abilities, but no ability scores – your PC starts with only one ability that can determine what class and types of skills she can attempt. So, for example if you rolled strength as an ability, you might choose to be a fighter, however any PC with strength could attempt to, say, bend bars. Index cards are the perfect size for P&P character sheets, although I like to use a Pits & Perils character sheet I created in Google docs for hangout games – I can share it with the other players or the referee allowing us all to edit it as needed. Encumbrance is very simple, you can carry armor, shield and 10 items, plus 1,000gp. That’s it. No tracking of weight, and a PCs movement rate is just based on what kind of armor they have. P&P uses a race-as-class system, the race/classes you would expect are there – Clerics, Magicians, Fighters, Thieves, Elves and Dwarves. Clerics, Elves and Magicians can cast spells by expending spell or faith points. 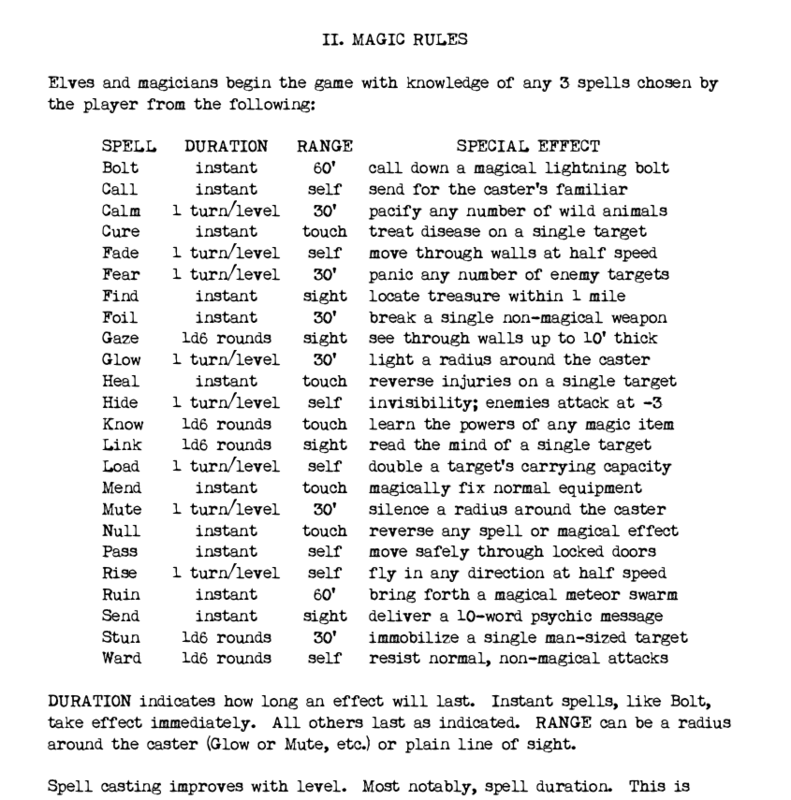 Unlike other OSR games there are no spell levels, any magician can cast any spell from the entire list of spells by expending a spell point. However, certain spells have a greater duration or affect as the PC advances in level. The spell list is quite clever, each spell is described by one four-letter word, like ‘stun’, ‘bolt’, ‘heal’ or ‘ruin’, with a paragraph on each describing how they work. 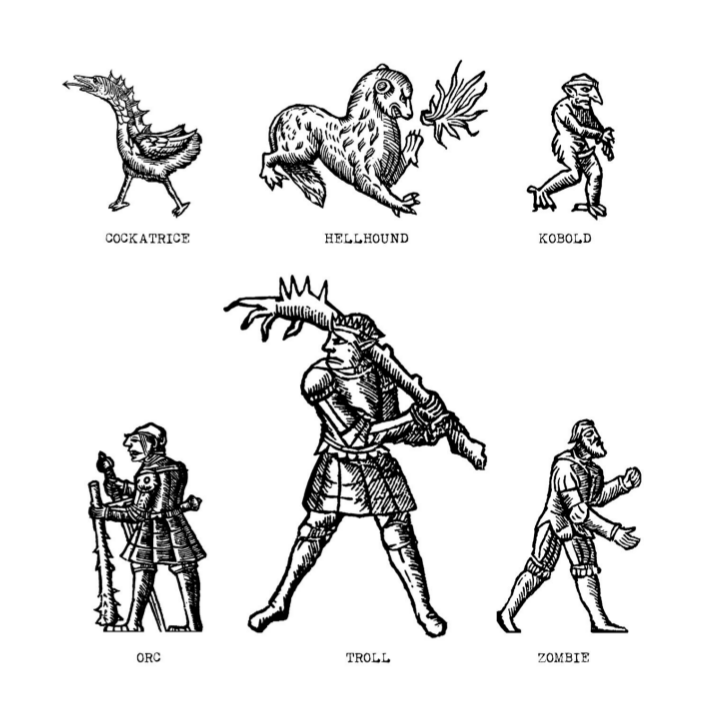 The monster list (monsters are called ‘enemies’) is full of the standbys you would expect as well as some unique creatures, with the usual terse descriptions. There are around 90 listed in the core rules, with many more between the two supplements. A decent selection of treasures and magic items are likewise spelled out briefly. The core book and two supplements are filled with woodcut illustrations and 1970s-like prose that accentuate the already unique feel of the game. It all has a neat, fairy-tale type of feel. So how does it play? Combat is very fast, and not as deadly for first-level characters compared to OD&D or other games of that era. As an example, fighters start with 10 hits at first level, and armor adds to a PCs hits. For example, a fighter in chain mail has 10+2 or 12 hits total. Against that, most enemies do one hit of damage on a roll of 9-11, two on a roll of 12. So players don’t have to worry about their first-level PC getting killed by a single blow from an Orc. Combat has a tactical feel, with hit bonuses given for flanking or outnumbering, and all two-handed weapons (including bows and slings) gaining +1 to damage. On the other hand, most enemies have 1-3 hits per level, so an Orc, which is a level one creature, just might be killed by a single lucky blow, more likely two – but still, this gives P&P a more heroic feel, at least at low levels. Which brings me to my only criticism of the game, that there is not much of a power curve for fighter or thief PCs as they advance in levels. Spell casters become quite powerful as they accumulate spell or faith points, but apart from getting more hits at each level gain, fighters and thieves stay pretty power-neutral until they hit 9th level. At that point, fighters get two attacks per round and thieves finally do double-damage on backstabbing attacks. But this is minor and overall, P&P is an excellent game that I highly recommend. Pits & Perils (along with some starter bundles and the other adventures and supplements) is available on DTRPG and in print at Lulu.